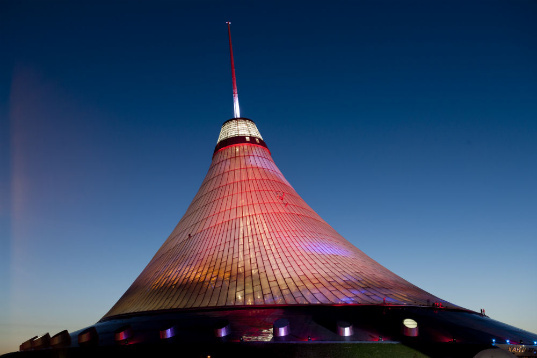 Yesterday saw the grand opening of the world's largest tensile structure - the Khan Shatyr in Kazakhstan. Designed by Foster+Partners, the new landmark will include entertainment facilities, cinemas, retail, restaurants and even a water park. 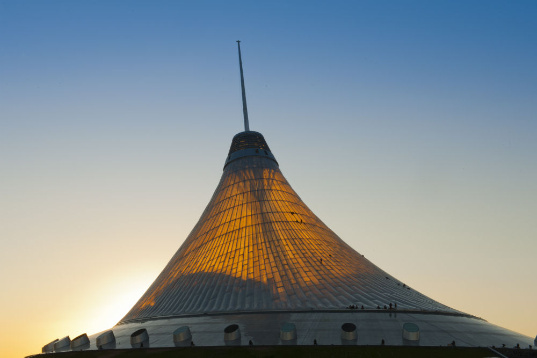 The center is covered in translucent ETFE and designed to withstand the region's brutal winters and hot summers, providing a welcoming oasis for the people of Astana. Weather changes in Kazakhstan are extreme — the climates drops down to -35 degrees Celsius in winter and can reach +35 degrees in summer. The Khan Shatyr is designed as a sheltering environment that provides a place to have fun and get away from the heat or the cold. To achieve an energy-efficient climate-controlled area, the tent is covered in three layers of ETFE, which allows light to filter into the tent below. In the winter, ice formation is prevented on the inside layer through temperature control and directing warm air currents up the inner surface of the fabric. Then during the summer, fritting on the outermost foil layer provides solar shading and cool air is directed across the space and vents at the top allow hot air to escape. The President of Kazakhstan, Nursultan Nazarbayev, was on hand at the opening ceremonies, which coincided with the president’s 70th birthday and Astana Day. 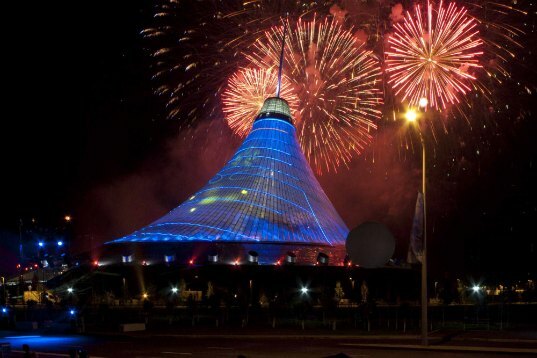 Fireworks and the Italian tenor Andrea Bocelli celebrated the new entertainment center, which will serve as a new venue for the people of Astana to enjoy. Inside the 150 meter-tall tent are a wide variety of entertainment and leisure facilities, including retail, cafes, restaurants, cinemas, and flexible spaces that can accommodate a wide variety of activities. Will Webster, a freelance photographer seen over at BLDGBLOG, also shot some amazing pictures of the tent right before its opening. Designed by Foster + Partners, the Khan Shatyr is a new entertainment and cultural center for the people of Astana. Standing 150 meters tall and sheathed in three layers of ETFE, the center is also the world's largest tent. The President of Kazahkstan was on hand with other dignitaries to celebrate the opening of the center. It was also the President's 70th birthday and Astana Day. In 1998, the President moved the capital of the country to Astana and poured £8bn into the city to transform it into a capital befitting Central Asia's most booming economy. The Khan Shatyr is part of the city's new urban plan -- it will serve as a mixed-use development for the city, providing entertainment, culture and public space. Included in the development are variety of entertainment and leisure facilities, including retail, cafes, restaurants, cinemas, and flexible spaces that can accommodate a varied program of events and exhibitions. The people of Astana will be able to enjoy the climate-controlled interior of the building and get away from the extreme weather outside, which can dip to -35 degrees Celsius in the winter up to 35 degrees in the summer. Three layers of ETFE sheath the tent to help efficiently heat and cool the interior. The ETFE also lets light filter into the interior, reducing the need for lighting. To keep the interior from freezing in the winter, the temperature of the air is tightly controlled and aimed up along the interior of the fabric -- this also helps prevent downdrafts. In the summer, the exterior offers some solar shading, while cool air is directed along the floor and hot air escapes up and out of vents at the top. The Center represents a major new civic, cultural and social venue for the people of Astana, bringing together a wide range of activities within a sheltered climatic envelope that provides a comfortable environment all year round. Nigel Dancey, a Design Director at Foster + Partners, said: “Khan Shatyr will be an important new destination for the people of Astana to enjoy at all times of the year, whatever the weather."